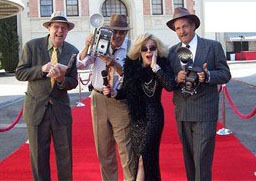 Make your VIP guests feel just like famous movie stars when greeted by our team of ravenous reporters at your next event. This talented troupe of improvisational actors have been respected favorites of Hollywood's biggest studios and best event venues. Whether it's shot-gunning questions to your 'celebrity' guests as they exit the limo and walk the red carpet ...or, going table to table for an 'exclusive' interview & photos with your company employees, these reporters start your event off right with high-energy fun. 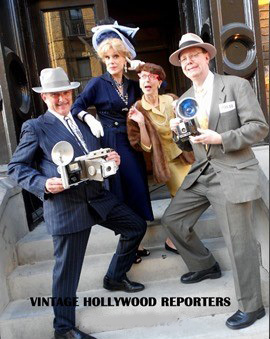 Critiqued as,"highly professional, beautifully costumed, uniquely clever and always entertaining," these classic and funny newsies bring the laughs & the golden age of Hollywood to your next special event. For larger groups in need of some extra Coverage, we also offer additional actors as, cheering fans. Great for guest arrivals, strolling or on-stage interviews, photos, customized questions for your company, product intros, announcements, crowd control & seating assistance ... or, you decide.